I delayed posting this entry until I could add pictures, so here goes. My dear husband bought me the most wonderfulest gift for Christmas. I usually don’t ask for gifts, for any occasion, but I’d dropped a hint or two this year. I wanted a spinning wheel. Thinking he didn’t pick up on it, or wouldn’t know what to get (the choices are dizzying), I put together a list of good wheels and discreetly "hid" it on my desk. Imagine my surprise when a spinning wheel arrived early, a week before Christmas. 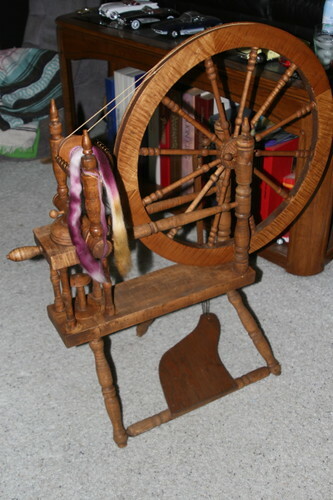 Not just any spinning wheel, but a Schacht Matchless. I hadn’t even put the Matchless on my list because it was too nice. 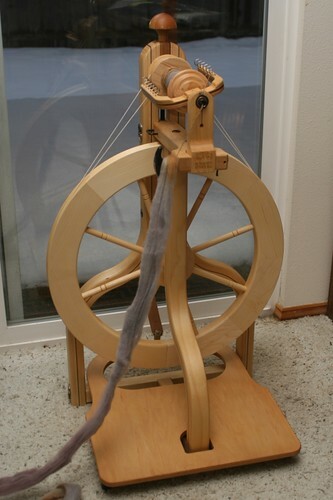 My husband, who doesn’t quite get my fascination with fiber, and calls my hobby "playing with string," did his own research and bought me the wheel he thought was best, before I even made up that list. If that’s not a keeper, I don’t know what is. So, thank you, dear. Thank you, thank you. Lovely, is it not? 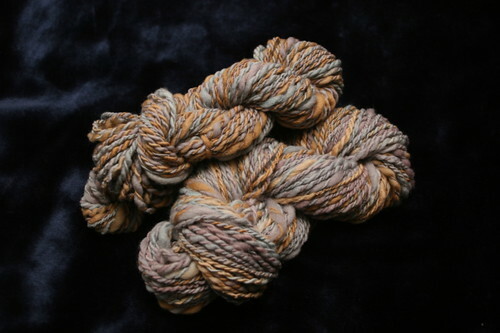 Here’s the first yarn I made with it, spun from merino wool from a Swell Yarn Shop, purchased at Renaissance Yarns. This actually didn’t turn out as well as my attempts on my mother-in-law’s wheel (here and here). I overspun it a bit on the new wheel, and, of course, the thickness is still all over the place. 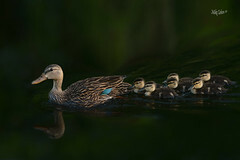 I just need some practice! I just bought some more fiber, too. Let’s see what I can come up with. Oh look, another fiber hobby. Right. 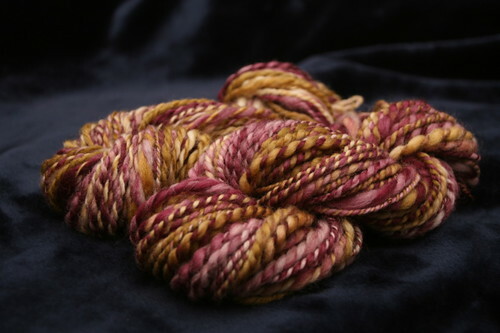 So, over the last couple of months I’ve been thinking about trying my hand at spinning. I went down to Renaissance Yarns during one of their spinning Sundays to see how it’s done. It was really neat, so I asked to try it out, and I did horribly. I couldn’t get the fiber to draft right, it kept getting wrapped around the bobbin wrong, bleh bleh bleh. I wanted to practice at home, but I couldn’t see my self buying a wheel yet. So I decided to get a drop spindle to learn drafting and how fiber behaves when spun. I ordered a spinning kit from Spunky Eclectic, which came with a Cascade Little Si spindle, a bag of Corriedale handpainted roving, and a bag of handpainted Bluefaced Leicester (BFL). I practiced a bit with the Corriedale, and I did alright. Not great, but alright. 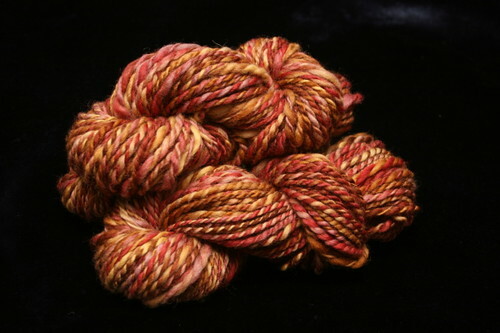 I spun a bunch of singles (what you get when you spin roving; you take multiple singles to ply yarn) but it was slow. Fast forward about a month, and there I am at my mother-in-law’s house. She has this spinning wheel, made by an uncle, and she graciously lets me borrow it. It’s a lovely wheel, all hand-crafted, in excellent working order. 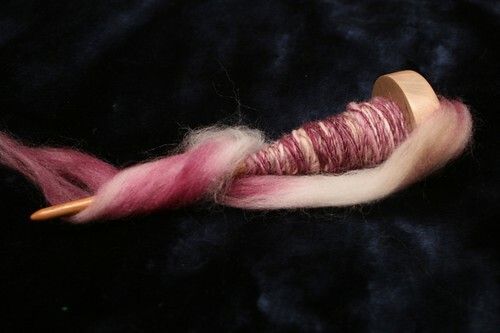 After I got the wheel home, I grabbed the Corriedale that I was using on the drop spindle and spun up some singles. My consistency is all over the place, but I get the hang of it. Eventually I spun enough singles to try plying. I plied two small skeins, soaked them to set the twist, hung them to dry, and voila, something that looks like yarn! As you can see, it goes thick and thin. I need to practice to get the thickness and spin to be consistent, but I think I’m on my way. The skein in the back was my first atttempt. I did the second skein (front) a little thicker, and the spin is a little better on it too. I think I might actually like spinning. Yeah, I need another fiber hobby like I need a hole in the head, but what can you do?